Instantly exchange Bitcoins into real money and play more games at BitStarz Casino. Thursday 12th February, 2015 – Bitstarz is back with more innovation to improve the overall experience of all their active players. Today they announced a new integration of the Cubits Merchant API. This system accepts Bitcoins and allows players to immediately transfer them to real currency in a quick, simple and very secure way. This is where all the bitcoin players are going to benefit. They can now deposit bitcoins through cubits and convert the currency to Euro allowing them the option to play on 400 extra games by the giant provider Quickfire. Games like Immortal Romance, Jurrasic Park, Thunderstrike II, Avalon II and many others. Players that deposit bitcoins through the new Cubits payment gateway and convert it to Euro, now also have the option to convert the Euro back to bitcoins. This would only be possible if the deposit is made with bitcoins through cubits. Same goes for withdrawals. You can only withdraw through the same payment method that you have deposited with, so if you have made a deposit with Skrill you cannot withdraw with cubits into bitcoin. 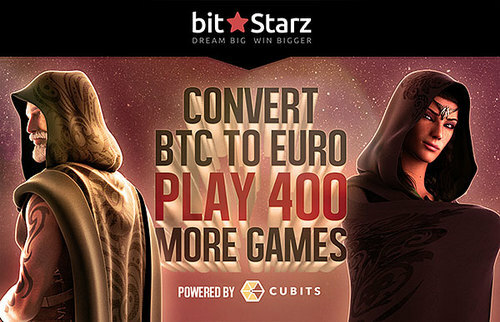 "Instantly exchange Bitcoins into real money and play more games at BitStarz Casino." The Head of Marketing, Nikolica Vadaski told us, from today, all our players will surely welcome this added value in their gaming experience with open arms. Players who only play with bitcoin will no longer be limited in their play options. They can now play on all Microgaming games that previously only could be played with Euro. Cubits CEO, Tim Rehder commented: "Working together with Bitstarz to bring Bitcoin payment to their great range of games has been an amazing experience, combining a professional collaboration with an inspiring exchange of ideas. We believe the Cubits Platform, the Bitstarz Casino, and above all, the players, will all greatly benefit from this step forward." Cubits are one of Europe’s fastest growing Bitcoin marketplaces. Their user interface is clean, simple and easy to use. Currently accepting 17 national currencies, people can buy, sell, and use Bitcoin almost instantly with the Cubits Wallet. As of today Bitstarz has extended its buffet of options which beside Microgaming already includes big names like Amatic, Betsoft, Ezugi and Softswiss. It offers over 600 games to play with and a choice of over seven real currency options (Euro, Australian dollars, British pounds sterling, Canadian dollars, Norwegian kroner, Swedish kronor, US dollars) and also the crypto currency - Bitcoin. Players can mix and match as they please. 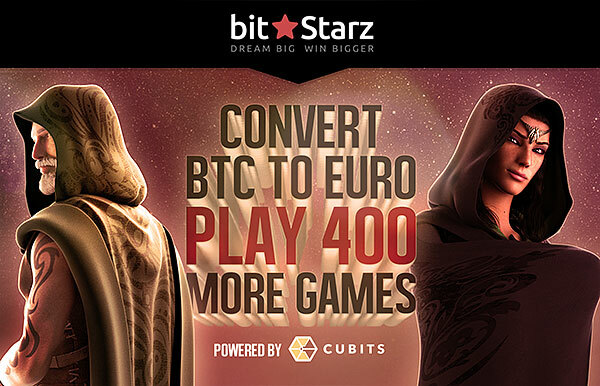 You can safely say that this new Cubits wallet introduction has made all of the Bitstarz available games multi-currency friendly adding heaps of flexibility to the player’s choice. This press release was distributed by ResponseSource Press Release Wire on behalf of BitStars Entertainment SA in the following categories: Men's Interest, Entertainment & Arts, Leisure & Hobbies, Women's Interest & Beauty, Sport, Consumer Technology, Personal Finance, Business & Finance, Travel, Manufacturing, Engineering & Energy, for more information visit https://pressreleasewire.responsesource.com/about.